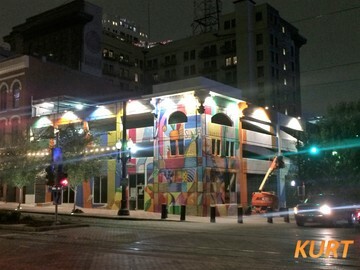 Through rain and heat, a Houston street artist, Dual, and Lighting Architect, Kurt Hall, have completed a large-scale mural on the side of a downtown building at Commerce and MainSt. in Downtown Houston. The mural, painted on the façade of a plain, four-story, 40-foot-tall, white facade has turned into an amazing, eye-catching work of art at “Produce Row” – a historical location in Houston, TX where farmers’ wares were sold to the public. According to a 1986 Houston Chronicle piece, the two-block stretch between Main and Milam along Commerce had a healthy heyday as a place for produce to be bought and sold starting in the 1870’s and spanning into the middle of the 20th century. Kurt and his team worked closely with Houston’s Up Art Studio to brighten this new piece of street art at night with a modern LED lighting design!